ThinkFun always lives up to its name with its products. Over my 14 years of teaching elementary GT students, we have enjoyed and learned from a lot of ThinkFun games. As a mother of a daughter who is now 11, I can say that our family has found them to be equally educational and entertaining. Last Letter is one of the newest games from ThinkFun, and I thought it would make a great Phun Phriday post. This simple card game can appeal to all age levels that know how to spell – or at least can identify the first and last letter of words. The rules are easy. Everyone gets 5 cards. The dealer puts down a card face-up and names something on that card. The first person to find something on one of their own cards that starts with the last letter of the word the dealer gave puts his or her card down, and the game continues in that vein until someone is out of cards. 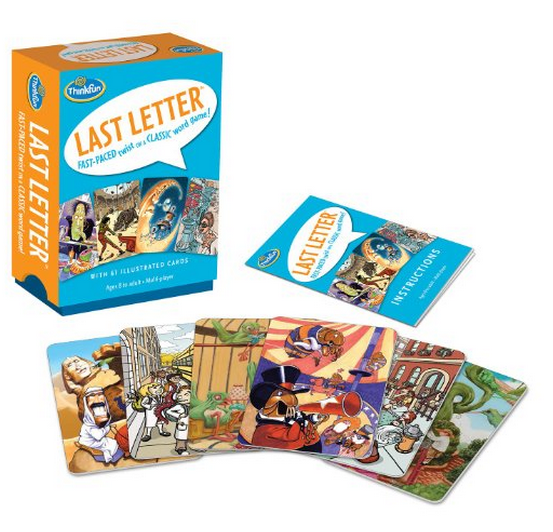 Last Letter is a great game to play as a family as it definitely broadens everyone’s vocabulary. Young and not-so-young can easily play together and learn from each other. You can also change the rules to make it more challenging for some or all of the players. For example, “no colors” or “no emotions” are two good parameters to set for older players. 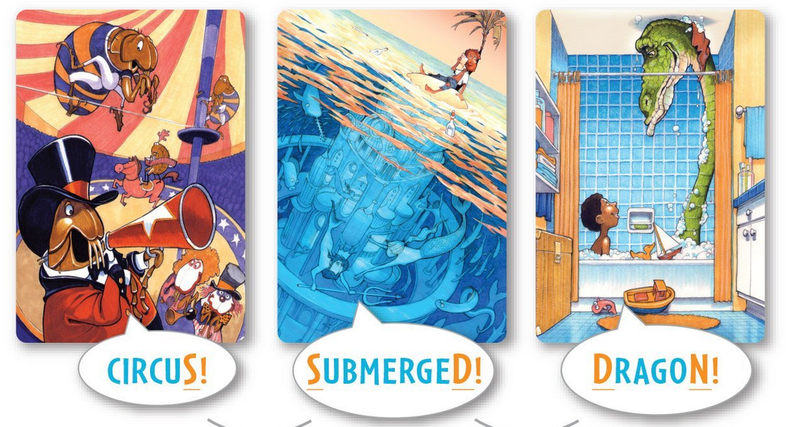 There are so many images packed into each card that you can play the game repeatedly and never be bored. Last Letter can currently be purchased from Amazon.com for $12.99. I am adding it to my Pinterest Board of Games and Toys for Gifted Students – but it is fun for all to play! You don’t have to be gifted or a student to enjoy it!